August 10, 2016 — Links International Journal of Socialist Renewal reposted from Antipodean Atheist with permission — US President Barack Obama, the first African American to occupy the White House, has used his part-African background to leverage influence in the continent of his ancestors. Let us first get something out of the way – no, Obama is not a secret Muslim; no, he is not ignoring the rest of the world to focus exclusively on Africa; no, his ethnic heritage is not anything to be ashamed of; no, his place of birth is not in dispute – let us dispense with these Trumpist, ultra-right Republican talking points for what they are – rubbish. 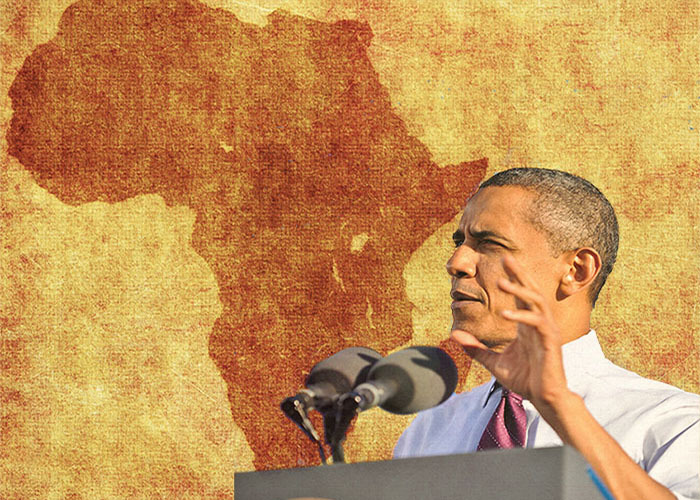 Obama has used his personal heritage as a political bridge into an important part of the world; Africa. Ethiopia, and East Africa generally, has always been strategically important to the great powers. It is not just from the early 1990s onwards that Ethiopia acquired the attention of the imperialist states. When Ethiopia was governed by a Communist regime (1974-1991), it was always regarded as a strategically important ally, for the former Eastern bloc countries. It maintained extensive trading, cultural and political relations with the other socialist countries, such as Cuba. The latter provided technical assistance, agricultural products, trade based on a system of mutual benefit and not profit-making with fluctuating stock market prices, and educators to school young Ethiopians in the socialist world-outlook. The United States, Britain and other imperialist powers viewed Ethiopia as a battleground – indeed, Africa was in the midst of a Cold War fought between the allies of the rival superpowers. Ethiopia was no exception to this, and the United States sponsored various ethnic-based militias in secessionist wars to topple the socialist regime in Addis Ababa. The United States at this time was interested in opening up Ethiopia to its economic imperatives, and using the disguise of humanitarian intervention, funneled arms and support for the ethnic-separatist groups, gathered together in the Maoist-oriented Ethiopian People’s Revolutionary Democratic Front (EPRDF). This formation, having acquired power in 1991 after the disbanding of the Eastern bloc and removal of the socialist regime in Addis Ababa, has hung onto power ever since through dictatorial measures. The people of Ethiopia have suffered chronic food insecurity for generations: the major reason, as is the case throughout the world, is poverty. Other causes are complex; some due to climate change, others result from the ruling regime’s policies. Action Aid (AA) reports that unequal trading systems are a factor. The Ethiopian government purchases crops from farmers at low, fixed prices. International organisations encourage Ethiopia to produce cash crops to export, which reduces the land available for growing domestic crops – yes, Ethiopia – where millions rely on food aid every year – exports food. The country’s top exports are Gold (21%), Coffee (19%), vegetables and oily seeds, followed closely by live animals and khat – a highly addictive narcotic. The Ethiopians experienced drought and famine during the socialist regime in the 1980s. The widespread famine of the mid-1980s brought the political situation to the attention of the international community. The reaction of the imperialist powers was to exploit the suffering of the Ethiopians for Cold War political purposes – food became a political football, with the BBC and various corporate media outlets broadcasting heart-rending images of the famine’s victims, and concerts were organised to raise money for food aid. There were no humanitarian motivations on the part of the governments of the imperialist states; they promoted the Euro-centric view that black Africans – and in particular, socialist black Africans – cannot feed and govern themselves. Any suggestions that there were natural causes contributing to the famine were dismissed out of hand, and the blame was placed squarely on the shoulders of the regime. It isno exaggeration to say that the U.S. is at war in Africa. The continent is awash with American military bases, covert operations and thousands of Western-funded troops, and responsibility for this escalation must be laid squarely on Obama’s doorstep. Today, global competition drives Obama’s foreign policy. During the past decade, the U.S. has engaged in a fierce battle with China for worldwide economic and military preeminence. The aim has been to encircle and contain China’s growing reach. The Economist reported a Department of Defense announcement that by 2020, 60 percent of American warships would be stationed in Asia, along with “a range of other ‘investments’ to ensure that despite China’s fast-growing military might, America would still be able to ‘rapidly project military power if needed to meet our security commitments. '” Intensified competition with China, and other powers such as Russia, is fueling the higher levels of U.S. military involvement in Africa and a new scramble for resources. This scramble is mainly about oil, in which Africa plays a critical supply role for both China and the U.S., but also about increased overall investment in resources–from diamonds and gold to land for agricultural investment. Beijing is of course looking out for its own interests; neither the Chinese regime, nor for that matter the former Soviet Union, was motivated by benevolent altruism. China has dealings with repressive states in Africa, such as the Sudan; the latter receives military equipment and arms in return for oil. Beijing has successfully acquired the oil markets of the new nation of South Sudan, importing 77 percent of the latter’s country’s oil. This is galling for the US, because the birth of South Sudan was nurtured by the US, who provided arms for its secessionist ambitions. The Chinese are building infrastructure in sub-Saharan Africa, providing billions in every sector of the economy, from roads to telecommunications to health. The Chinese government is better at presenting itself as an equal trading and business partner for Africa, with the volume of trade reaching 222 billion dollars last year. The United States is viewing the soft power approach of the Chinese in Africa with anxiety. It has responded with a mixture of escalating militarisation of the continent, and corporatisation of its business interests. The United States, while portraying its intervention in Africa as an anti-terrorist exercise, is actually the main purveyor of political destabilisation and violence. It is time to examine the US war on Africa, this undeclared offensive that the US military wants to keep hidden from public view. The election of an African American president was used to draw a false finish line underneath the problem of racism in US society. An African American president in the White House did not change the system, because it is not the presidential office that needs changing, but the imperialist system itself.